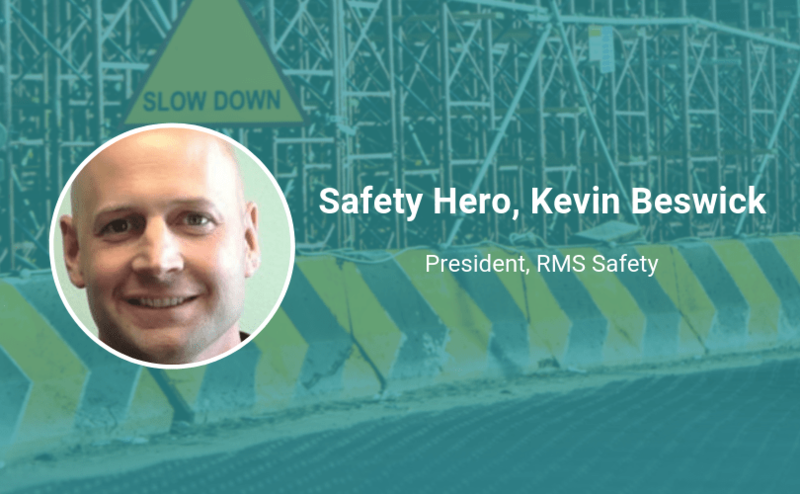 Kevin Beswick, President, RMS Safety, is a very passionate and driven safety professional. On any given day, you can find him leading strategic planning initiatives and working with RMS Safety’s management team to pursue, grow, and further support healthy client relationships. He’s a Safety Hero who enjoys challenges and working with people and companies to support their safety programs well beyond minimum standards. Keep reading to learn what drives him to always give 100% and to learn about his valuable (and practical!) pieces of advice for anyone starting out in safety. “Whatever you do, do it all for the glory of God” (1 Corinthians 10:31). Personally, this drives me to always give 100% in everything I do (no matter what I’m doing or who notices) and to always try to walk with integrity. This has served me well in my personal life and in my career. As the President of a large safety consulting firm, I am responsible for the direction of our company and its overall success. With 25-30 employees, it takes a lot of organization and clear communication to keep everything moving in the right direction, so I would say those two characteristics are definitely important. I also feel that “humble confidence” is important for any leadership role. Those who lack confidence will have a difficult time getting people to buy-in and follow them, but those who are arrogant about their level of confidence turn people off. It takes someone who knows they can do the job, but who also realizes they don’t have every answer and can benefit from the input of others. What’s your advice for someone starting out in a role that supports safety and/or health of employees in some capacity? I think two of the biggest challenges inexperienced safety professionals face are gaining respect from others, and learning when to stand firm or bend. Safety professionals who don’t have the respect of workers will not see much success. One way to gain respect is to get to know what employees do and why by asking a lot of questions and maybe doing the work yourself. I personally worked as a “Laborer” for 3-weeks when I started my position as the Corporate Safety Director for Miller Pipeline. One other pointer for gaining respect is to say, “I am not sure but I will find out and get back with you!” whenever you aren’t sure of an answer. People will actually respect you when you do this and they will start to feel as if they can trust the answers you do give them. Safety professionals who are promoted internally and don’t have formal training often find it difficult to stand firm when they need to. They have been part of the, “I’ve done it this way for years and never got hurt” culture and can struggle to break that line of thinking. On the other hand, those who learn safety in a book and don’t have any practical work experience can struggle to realize that sometimes the things printed in those books aren’t practical in reality. Effective safety professionals understand they can’t turn a blind eye when a hazard exists, but they also realize that an unconventional solution may be necessary to control that hazard. When I worked for Indiana OSHA, the very first fatality I investigated involved an electrocution. During the investigation we interviewed the business owners and had to ask questions like, “Do you have a written policy that relates to working on live energized parts? Can you provide proof of this employee’s electrical safety training? Did you provide this employee electrical PPE to wear? “ Unfortunately, the owners answered “No” to all of these questions, but they answered them through their tears while they sobbed. The amount of guilt they both felt was obvious and extreme. As I drove back home that day I realized that the career I chose was not just a normal job. I realized that people lives can be impacted by my performance and the decisions I make. That experience definitely changed the way I look at my job. “Treat others the same way you want them to treat you.” (Jesus Christ ~ Luke 6:31) Practicing this doesn’t just allow me to shine my light to the world, but it has also helped me be successful at work. Whether I’m trying to correct an unsafe behavior with an employee, coach a Supervisor to do something differently, or encourage an owner to invest in safety…I have learned that treating others with respect and dignity increases the chance of that person wanting to work with me. It fosters healthy relationships that accomplish results.